Pencil OCT® - rowiaks Webseite! For ophthalmologists, Optical Coherence Tomography (OCT) is the method of choice for diagnosing numerous retinal diseases. Analogous to sonography but by using light, individual layers of the retina can be visualized to diagnose diseases of the optic nerve. Up to now, you use large table-top devices for this task. They scan the eye of an upright sitting patient and should be firmly installed in the treatment room of a clinic or practice. 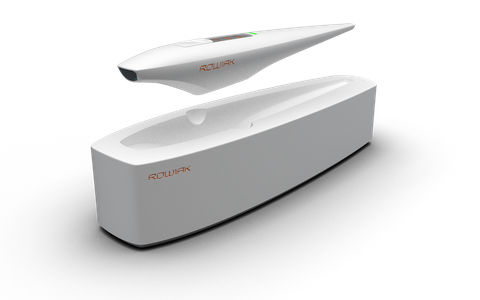 ROWIAK presents a mobile OCT device in a convenient pocket-size format. The Pencil OCT® consists of two parts: a stationary dock that fits on every desk and a handheld device that the doctor uses to perform the patient's examination. It is small, handy, wireless and similar to a digital clinical thermometer, easy to use. Apart from the simple and very flexible handling, the detachment from the stationary workstation is an enormous advantage for the user. The acquisition costs of the device will be significantly lower than those of conventional table-top devices. The Pencil OCT® is currently in the prototype phase, market entry is planned for 2020. Applications in other medical disciplines are in progress. No time to make a phone call? We will gladly call you back. Just leave your name and phone number here. Note: Please fill in fields with *.